At Gold & Wood workshops, passion and time drive the hands of the artisans who craft each component, one by one, in the purest tradition of exclusive eyewear. Their discreet and stylish looks, as well as the quality and nobility of the material used in Gold & Wood frames, give them their uniqueness. Finishes can be shiny, satin, matte, or brushed. The proprietary spring hinge is built by a Swiss watchmaker. The woods, which are waterproof, hypoallergenic, and ultra lightweight, come from an FSC-certified supplier. That means they're harvested from sustainable plantations, not taken from rainforests. Woods used include ebony, tanganika, amaranth, and bubinga. They glide into position smoothly and are light and very comfortable. It takes a close inspection to realize they contain wood components because the surfaces are polished so smooth. When you try them on, you'll appreciate the craftsmanship put into every Gold & Wood eyepiece. 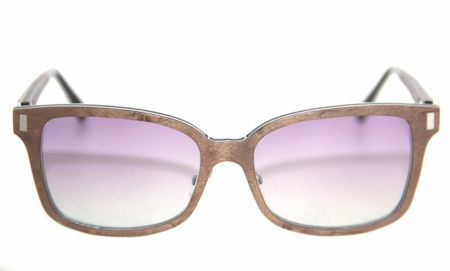 Our Gold & Wood sunglasses are brand new and guaranteed to be 100% authentic!